Black Friday is synonymous with great offers and bargains and if you book by 24:00 on Friday 23 November 2018, Club Esse gives you amazing prices to spend the New Year’s Eve on the snow in Pila, on the slopes of the Valle d’Aosta Alps, among the highest peaks in Europe. It’s that time of year again, when everyone starts asking you: “What are you doing on New Year’s Eve?”. 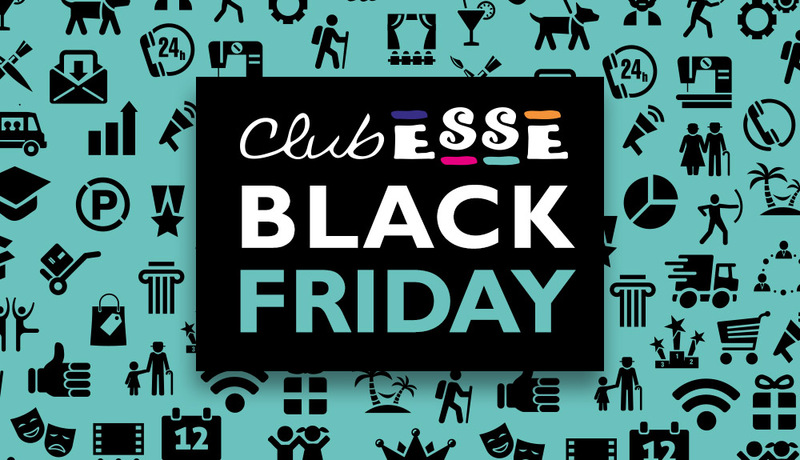 And the answer is Club Esse’s Black Friday, which answers the question “What to do on New Year’s Eve”. Book your holiday on the snow, ski and have fun on 70 km of snow-covered slopes just 30 meters from the Club Esse Pila 2000, with the splendid view of Mont Blanc, the Matterhorn and the Gran Paradiso Natural Park. Make sure you stay in Valle d’Aosta at advantageous prices by confirming your reservation by 24:00 on Friday 23 November 2018: hurry up, the availability is limited! How to apply the Black Friday offer to your online booking? If you book after 18:30 on Friday 23 November 2018, you can only do this online on the Club Esse website. In order for your online reservation to be valid, you must enter the discount code black2018 in the “Club Esse Card or Coupon” space, and a discounted rate will be applied to your stay. It is necessary to confirm the reservation by 24:00 on 23 November 2018. When is your reservation considered confirmed? The reservation is considered confirmed once you have chosen the type of payment (credit card, bank transfer or Paypal) and clicked the “Book” button on the page to choose the type of payment. We require a deposit of 50% of the entire stay at the time of confirmation and the total balance by December 15, 2018. Is the discount only possible on Online bookings? No, this offer (subject to limited availability) is destined to all bookings made before 24:00 on November 23rd 2018. From 18:30 on that date, it will be possible to make reservations only online through the Club Esse website. * The offer, subject to limited availability, is only valid for bookings in double rooms (even with 1 infant 0-3 years) confirmed before 24:00 on 23/11/2018 in half board formula. ** Reservations made after 18:30 must be confirmed online at www.clubesse.com. *** We require a deposit of 50% of the entire stay at the time of confirmation and the total balance by 15/12/2018.